How rare are female orange tabbies? Quite! Let’s meet one! Thank you for another amazing year. Would you believe that in just a few months we will celebrate 22 years since Cat Faeries was created? It’s true! During this past year we heard from hundreds upon hundreds of amazing people who told us about their amazing cats. Your kind words and stories mean the world to us – truly. So many of your messages to us moved us to tears, sometimes joyful tears, and sometimes very sad tears – but we welcome them all because feelings are beautiful and are to be cherished. As we say good-bye to December which was Cat Faeries “white cat month” we also bid adieu to 2014. To welcome 2015 we proclaim January is Orange Cat Month! Send us photos and stories about your orange cats, your marmalade cats, those creamsicle beauties to catfaeries@catfaeries.com – put the words Orange Cat in the subject line and we’ll start posting their orangey selves to Pinterest, Facebook, Instagram and Twitter and in our January newsletters. “Velveeta is eight years old. I adopted her from local no-kill shelter, Crash’s Landing, here in Grand Rapids, MI. They think she was about two years old when they found her in 2008. She was adopted once but returned after several months because she didn’t acquiesce to the diva cat already in residence. Crash’s Landing will take back any cat they adopt out – no questions asked. In her bio it said that she needed to be the only cat and preferably the only pet – which was perfect for me! I had dogs my entire adult life, but now I’m no longer able to care for a dog. Needing a more independent pet I thought the right cat would be better for me. Was that ever the truth – and I found the most perfect cat in Velveeta! We made a pact the day I brought her home: now living with another diva, she’s the princess because I’m the queen. In the almost three years since we have both worked very hard on our relationship, getting to know and accept (tolerate?) each other’s habits, likes and dislikes. She has learned I don’t like even play-biting, or gentle nipping, and I have learned that hair balls are part of the natural processes; sometimes I have to hunt them down, other times they’re presented, almost gift-like. She has the sweetest most patient temperament. She’s very loving, more so as time goes on. I hope she knows she will live here forever. For now I believe she knows that she is safe and very loved. 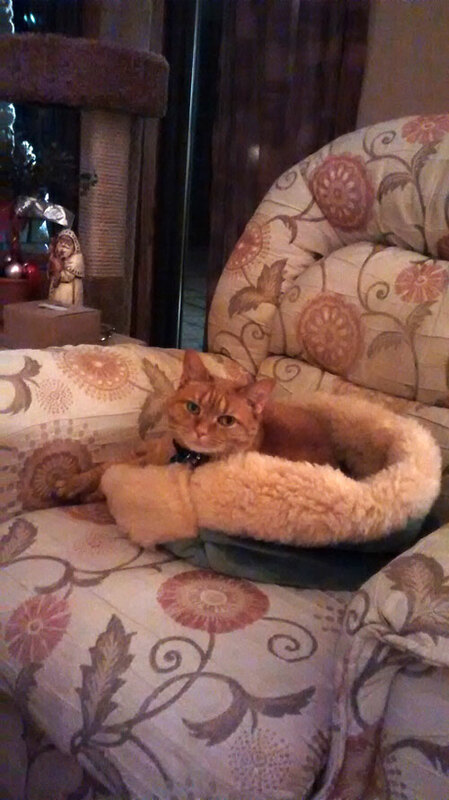 This is Velveeta in her new Cat Faeries bed. This is Velveeta waiting for her new bed to arrive! Here’s a great article about female orange cats written by a long time Cat Faeries friend: JaneA Kelly. JaneA is a very good writer so this piece is a lively mix of science and genetics, with a big pinch of humor, and some cute photos all of which are guaranteed to both educate and amuse you. And yes, that’s her name! Cool, isn’t it? Thorn L. who is another favorite customer and friend of Cat Faeries volunteers at cat shelters wherever she goes, and she tells us: “I had an angel of a perfect orange tabby girl in my feral colony before I left Charlotte. When I took her to the vet, it was as if I’d brought some kind of princess or prophet in! Needless to say, she was adopted immediately.” Thorn is yet another cool name for a Cat Faeries human friend! 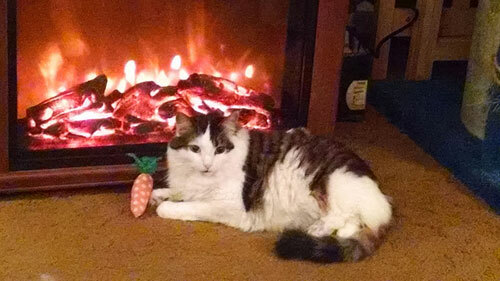 Amanda, a special needs cat who shines brightly this holiday season. Thank YOU Rob, Moira, and Amanda. It will be impossible to be Bah! Humbug!” this holiday season knowing that angels like you exist. Our wish to our readers and customers is for a peaceful, delicious, happy, merry, bright, and as Amanda would say “Playful!” Christmas. Avoid these indoor holiday plants that are potentially lethal to cats! 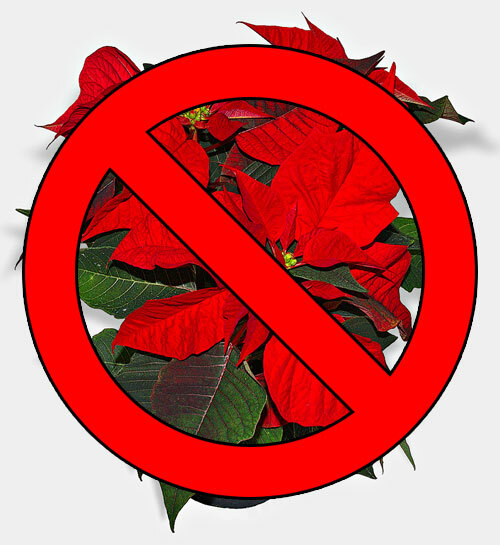 Poinsettias, mistletoe and lilies – these are but a few of the indoor house plants that are toxic to cats! Here’s a complete list of cat-unfriendly houseplants. Bringing flowers to a home with cats? Roses are a good choice BUT they should be grown locally, and better yet, they should be grown organically! Why is organic important? Most roses sold in the U.S. come from Colombia or Ecuador where they are grown in greenhouses which use a shocking amount of pesticides. Anti Icky Poo belongs in your wash! There’s a reason I wear a lot of black, I’m a klutz and spill or drop things on myself all the time! Even black clothes will show an olive oil or salad dressing stain. As we all know, oil seems to become one with the fibers of fabric and won’t budge. Ta da! Anti Icky Poo to the rescue – not only is it the best urine cleaner we’ve found it’s also a great pre-soak for clothes! Depending on how many stains are on a garment you want to measure Anti Icky Poo accordingly. Let’s say that one top has a 2 inch diameter oil stain – use 1/8 cup straight out of the bottle. No need to rub it in. If you’ve got a basin or a enamel tub put the garment in it and add just enough cold water to wet the piece. Let it soak overnight. After soaking wash it with a mild soap (Seventh Generation free and clear is our favorite) in cold water. The stain should be gone. If you still see some, repeat. You can do the same process for those embarrassing yellow stains we get on our collars and under arms. We’ve found that these can take two treatments. If you are noticing a smell build up in your clothes (gym wear, socks, bath towels, etc) that isn’t washing out, especially if you are washing in cold water, Anti Icky Poo will rescue this problem too. Since hot water will shrink or compromise the color on our dark clothing try this: pour some Anti-Icky Poo in the pre-soak cycle to eat up the bacteria that’s giving off the smell. It may take several washings using this method to get the odor out, but once you do, it’s gone for good. Two weeks ago we wrote a story about alternatives to pilling our cats. If you missed that article, here is it is – Non-pill medication for cats from Koshland Pharm, the compounding pharmacy we endorse. 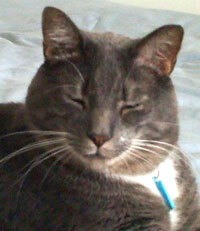 Our contributor, Newton, is a very smart cat and always has something to say. This is a topic near and dear to his kitty-heart! Here’s what Newton has to say about medication. I can testify that my flavored medication is quite tasty. But there are still those of us who are, and will remain, Finicky Felines. This group will likely face the first 4 options. A. There are many jokes about “how to pill a cat” (usually pages long), but it is truly not a laughing matter. No matter what technique a pet parent uses there is one simple rule. The key to getting the pill into the cat is getting it on the back of the tongue so Kitty swallows, rather than spitting it out. Some people find that a “pill popper” is helpful, especially if they have large fingers. A subsequent dropper of water (plastic only!) will prevent the dry pill from getting stuck. Wrapping Kitty in a towel (aka the kitty burrito) can be calming and reduce injuries. B. If a medication is particularly bad tasting it may come in a capsule. Here correct positioning on the tongue is even more important than with a pill. Muffin, a friend of mine, accidentally bit into a gelatin capsule of bitter medicine. To make matters worse, it got stuck on her tooth! Needless to say, this was a most unpleasant experience for all. C. After a bad experience cats demonstrate that they have jaws of steel which will open for nothing. Pet parents may then choose liquid medication. The important requirement is to get the dropper inside the cat’s cheek and administer slowly enough to give Kitty time to swallow. However, can someone please tell me who decided cats are partial to banana or bubblegum flavored antibiotics? My older brother, Indiana Jones, would gag just at the sight of the bottle! Right now I only know of one common cat friendly antibiotic liquid available directly from your veterinarian. D. There is one injectable antibiotic popular for hard to medicate cats. OK, it involves a small needle – BUT – the shot lasts a full 2 weeks. It isn’t safe for everyone. The manufacturer cautions against use in patients with allergies to penicillins or cephalosporins. https://www.zoetisus.com/products/convenia/pages/convenia.aspx However, clinical trials documented the safety of Convenia in the general cat population. https://www.zoetisus.com/products/convenia/documents/convenia_pi.pdf Any drug has the possibility of causing adverse effects. Once the shot is given you can’t “take it back”. so this method should not be used without careful evaluation of alternatives. What you choose will depend on availability and on the dosing frequency required. For example, deworming medication may be given only once (with a followup dose in 7-10 days), while antibiotics generally require a full 10-14 day regime. A single dose may be relatively easy to administer. But even a compliant cat may become weary after a week of twice a day medication. Life saving medication for chronic diseases (e.g. hyperthyroidism) involves other considerations. Transdermal methimazole for hyperthyroid cats is often the preferred treatment option. Remember, the most important thing is your cat’s health. Work with your veterinarian to find the best method available for making sure Kitty gets the full benefit of prescribed medication.